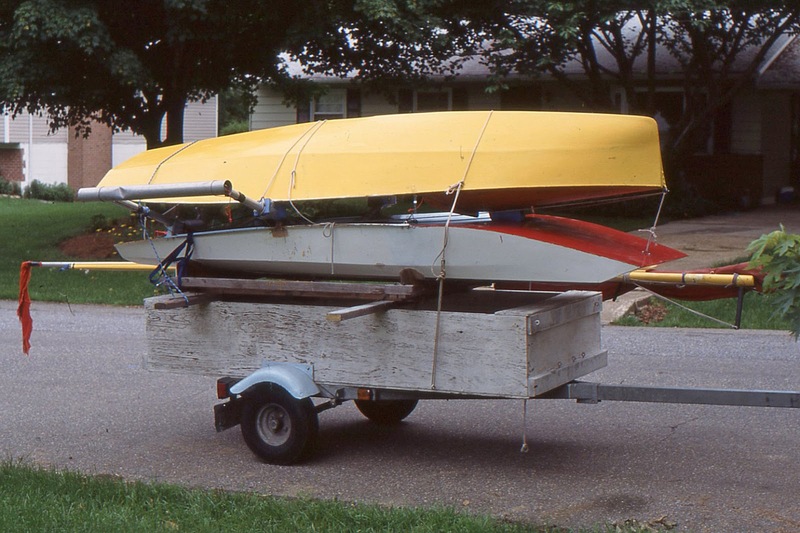 These photos are of two of my early Moths, taken about twelve years ago, doubled up on my trailer for a trip to the Brigantine Regatta. 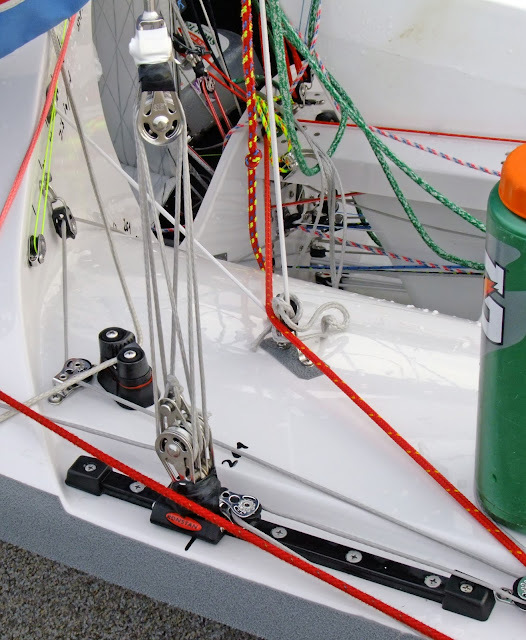 On top is my Classic Moth, the yellow Energizer, a modified Stockholm Sprite and on the bottom was my winged scow Moth, Flatoo-a-T. Back then, the Brigantine Regatta had a "Modern Moth" division for winged Moths and I gamely raced my scow in that division, with little success. If I remember correctly, my friend Bill Beaver, raced my Classic in a couple of races. For some reason I made a set of custom fiberglass mudguards for this trailer (hence the blue color). 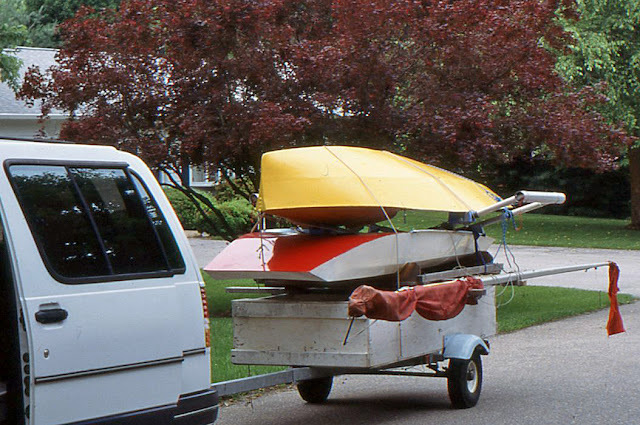 Both of the Moths, the trailer, and the Ford Aerostar van are no longer in my possession (the van and trailer junked, the Moths sold off into oblivion). The dent in the aluminum wing tube, visible in the photo, is where a fellow Classic Mothie rammed me head on (he was on port prompting an exchange of pleasantries). The blogmeister in the yellow Energizer. 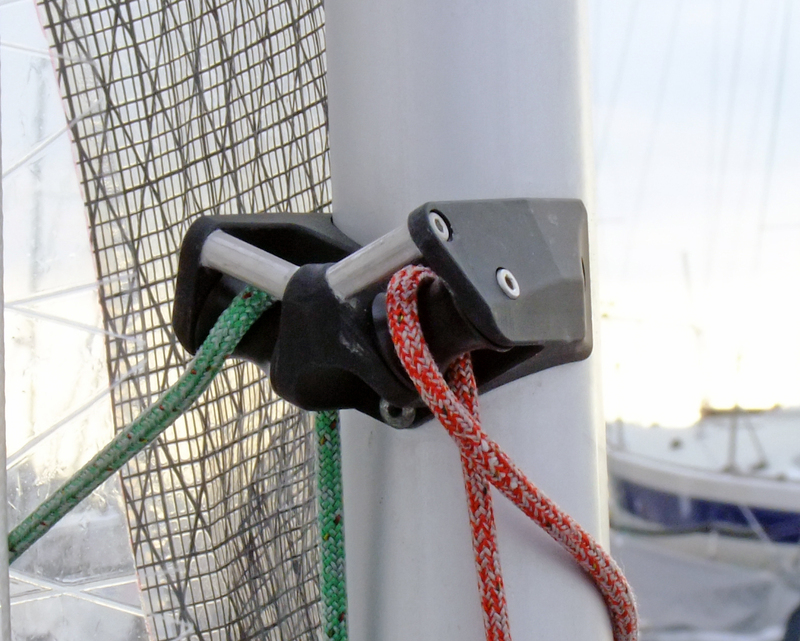 Click here for my original post in Earwigoagin about my scow Moth. My story on my winged International scow Moth has disappeared from an International Moth website. I reprint it here. 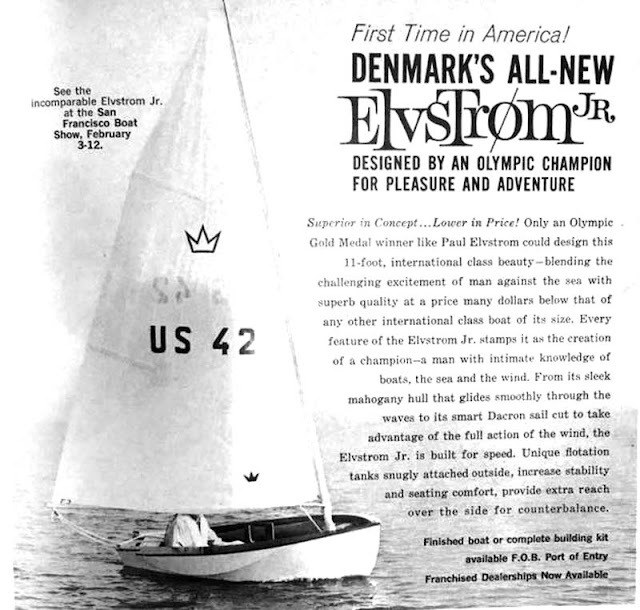 Paul Elvstrom, who, for my generation, is the greatest racing sailor of all time, introduced this dinghy in the 1960's. About the same size and weight as the Philip Rhode's cat-rigged dinghy, the Penguin , it obviously had nowhere near the popularity of the Penguin - in fact I have never, in all my travels, come across this dinghy. It remains a ghost, an entry, 50-odd years ago, in the One Design and Offshore Yachtsman's magazine annual review of dinghies, nothing more. 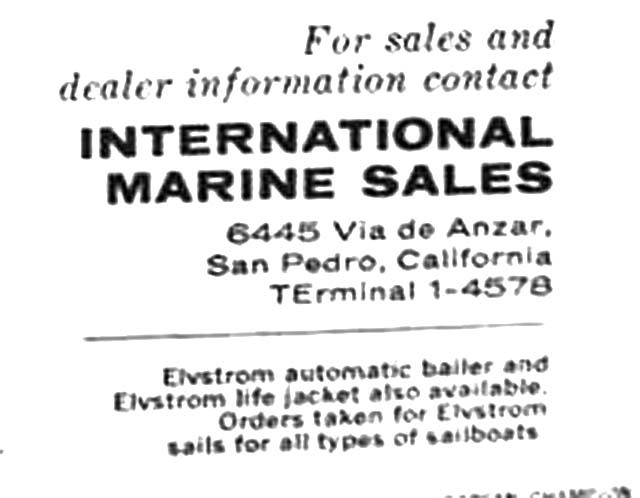 It would be very interesting if a reader could direct me to an extant example of an Elvstrom Junior. [Update: 05/06/17] After this post had been up for six months, Mike Scott came across an ad for the Elvstrom Jr. that was posted on Facebook. I've chunked the ad into four pieces. This photo of the Jr. car-topped on a Beetle shows clearly the outside buoyancy tanks. 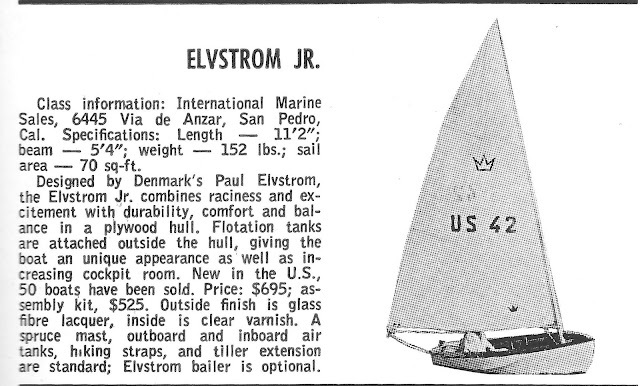 Similar in size and weight to the Elvstrom Junior, the American Philip Rhodes Penguin (from this post). And some geezer bloggers admiring a Penquin dinghy. Nothing complicated. 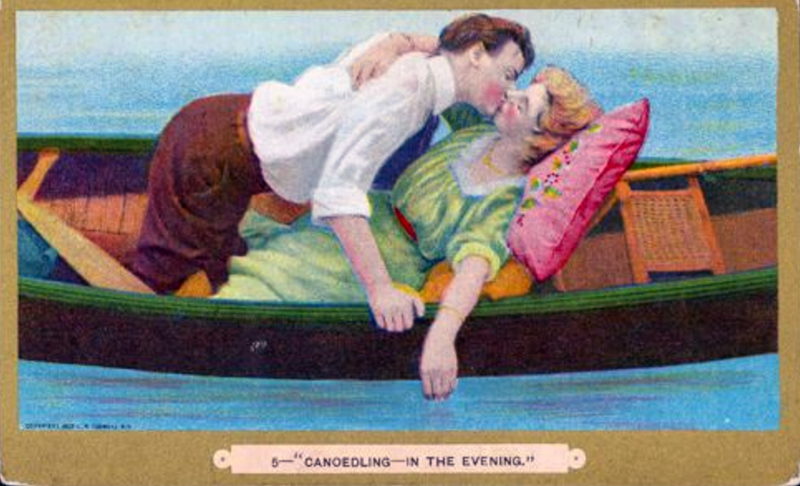 Love song. Basic Lyrics. Good voice. Boppy beat. Smooth listening. Jones - 'Melt' from Bullion on Vimeo. 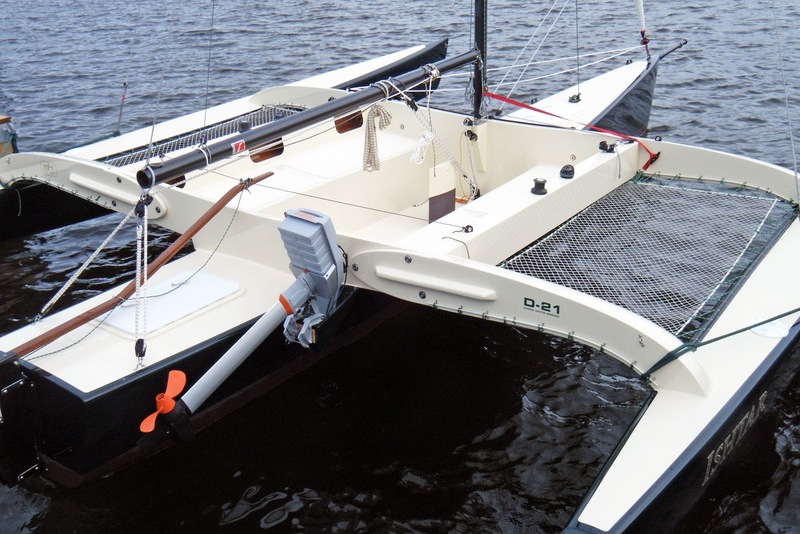 The previous header photo is of Gary Gowan's home-built, modified, Cates-design Moth. 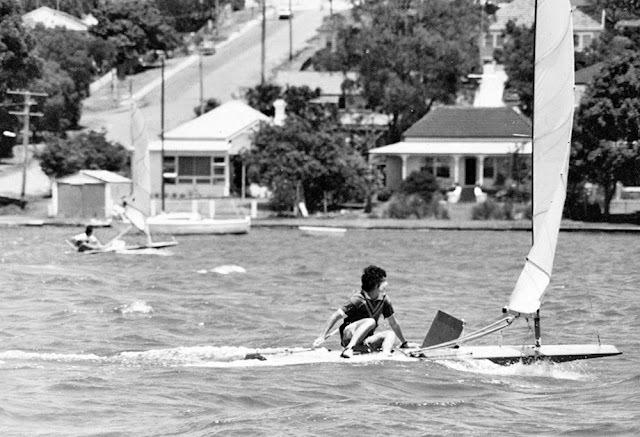 If memory serves, I think he has won two Gen I National titles with this Moth (note the wooden mast as well!). The Cates design was the most popular of the Classic American Moths of the 1960's, and examples keep popping up to this day, all over the U.S.. 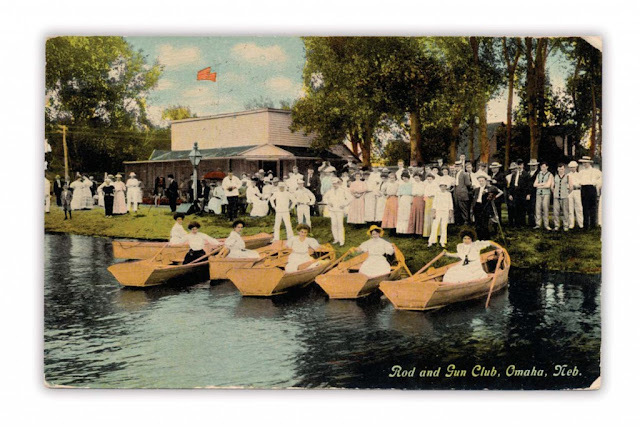 I've learned from conversations with old-timers that raced them as juniors that this design was much modifed; some having fuller bows, different chine configurations and so on. Gary's Cates has a wider transom. 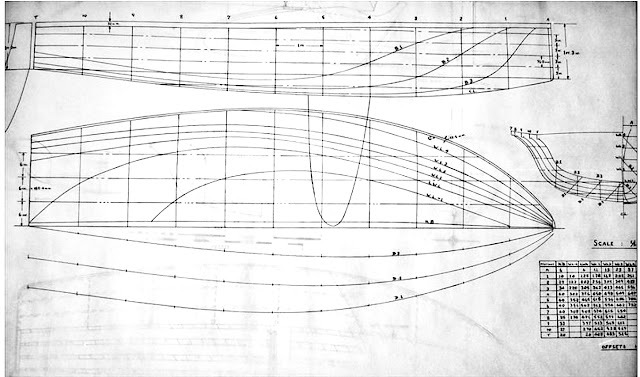 The section on the Cates design over at the Moth plans post. 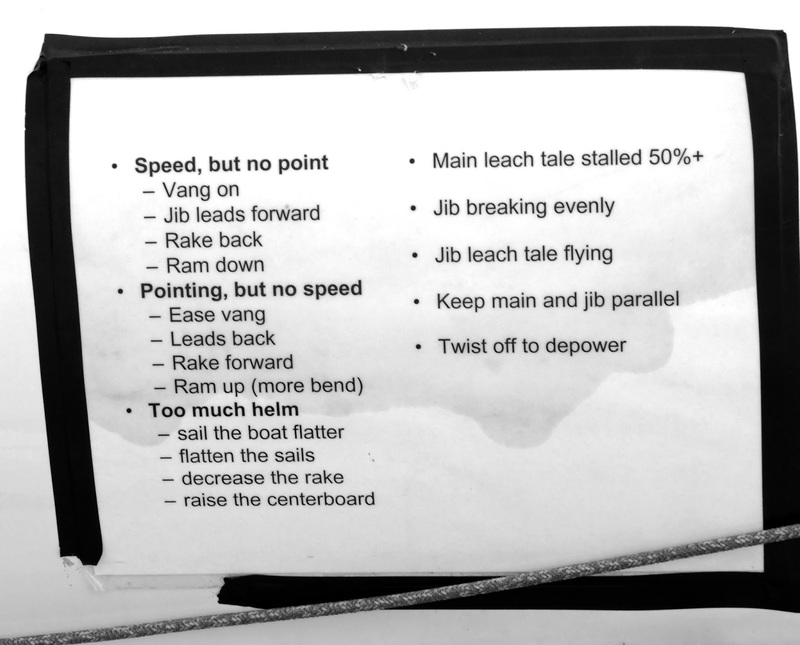 A short discussion over at Woodenboat forum featuring the Cates (among others). 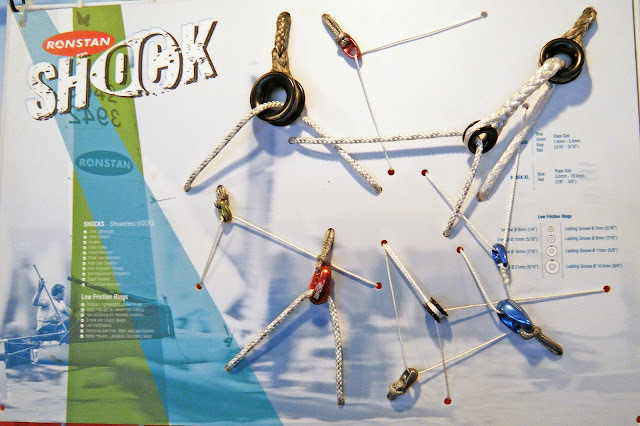 For some reason, when I do a Google Search on Earwigoagin Header Photo, I get a good compilation of images from this blog. I didn't make this year's Nationals because, for most of the summer, my head wasn't into racing. Turnout was off this year for the Nationals but the local fleets in Maryland and South Carolina are gaining strength with local regattas featuring 11 Classic Moths - so a bit of a trade-off. "If you know of anyone who could use photographic coverage of any sailing event please let them know I'm available!" 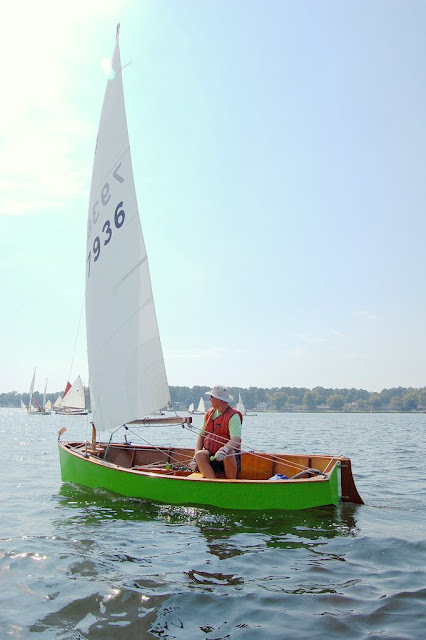 Bill Boyle debuted his brand new woodie - a cedar-strip Europe Dinghy, one of two home-built Moths seeing their first Nationals. Bill is slated to build a second one over this winter. Click here for Bill's website on the Europe build. 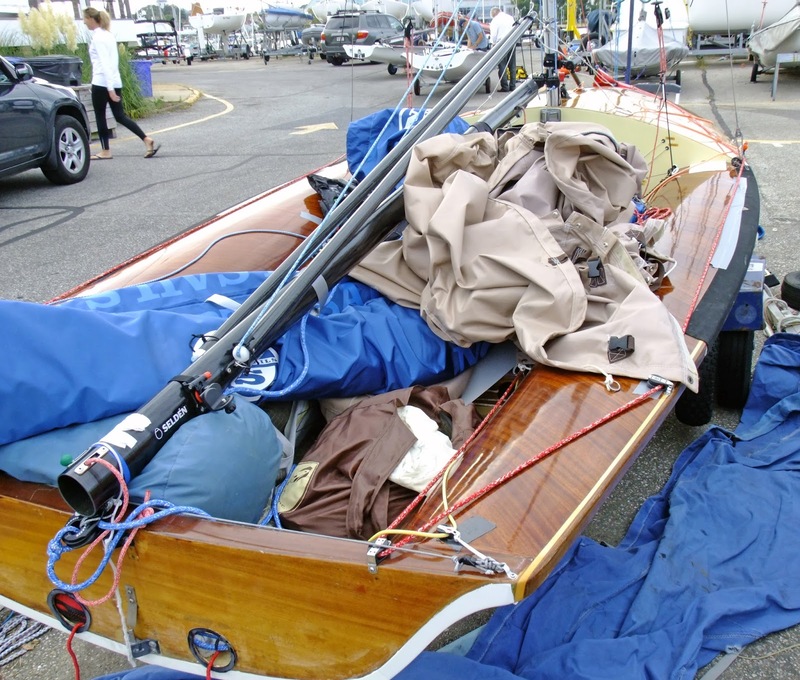 John Zseleczky (on the right) debuted the second home-built woodie, his Y2K-mod Mistral, and finished 2nd overall. His build was documented here. Blogger George Albaugh finished 3rd in the Gen 1 class with his Olympic Europe Dinghy. 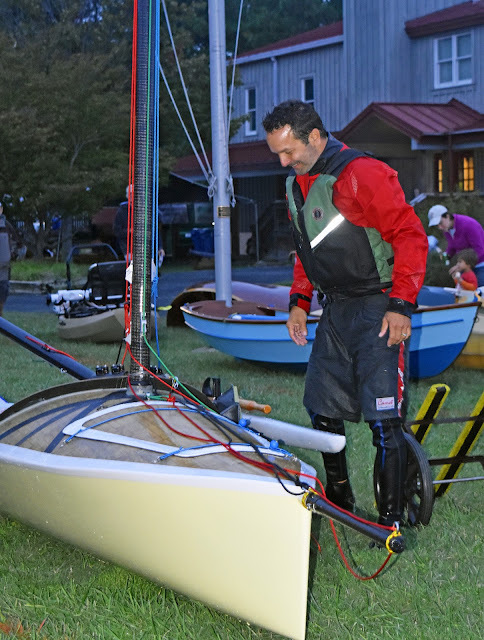 George's more complete report on the 2016 Classic Moth Nationals can be found here. Gary Gowan won the Gen I division in his home-built, woodie, modified Cates (he actually finished third overall which I think is a first for a Gen I since we started slotting the slower designs into their own division). 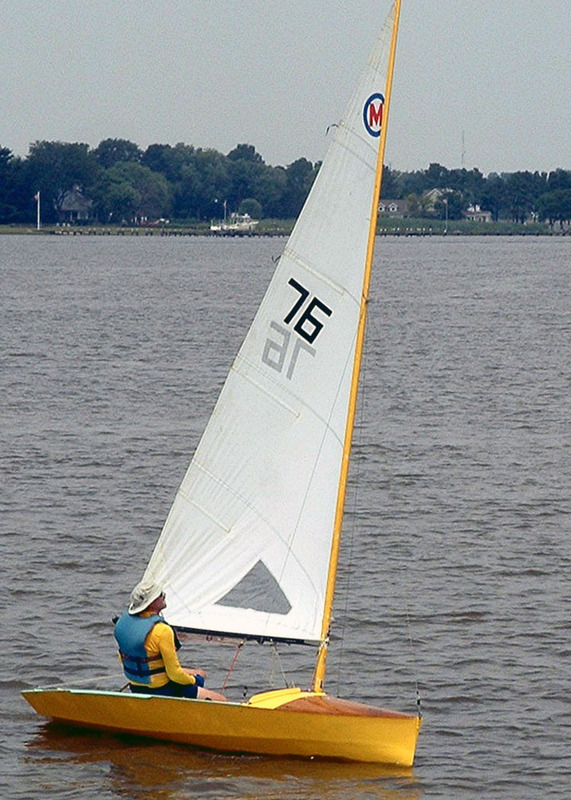 Finally, not a Darin McCauley photo, but one by John Z, of his new Moth with the race area on the Pasquotank River in the background. 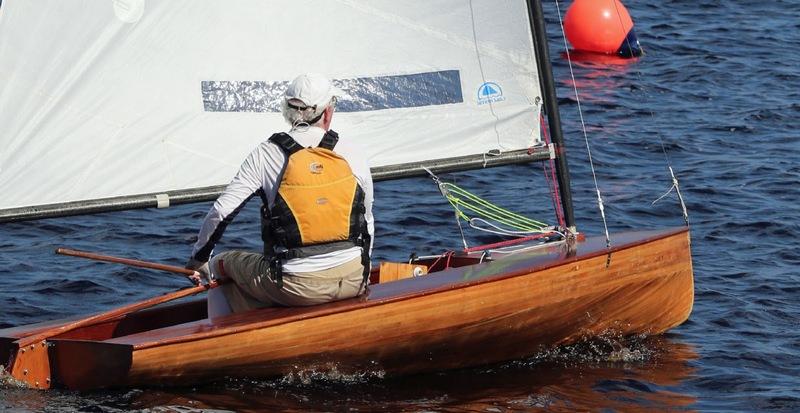 Results of the 2016 Classic Moth Nationals. Congrats to Mike Parsons, the 2016 champion. For the first time in a while, there were no vintage Classic Moths racing in 2016. 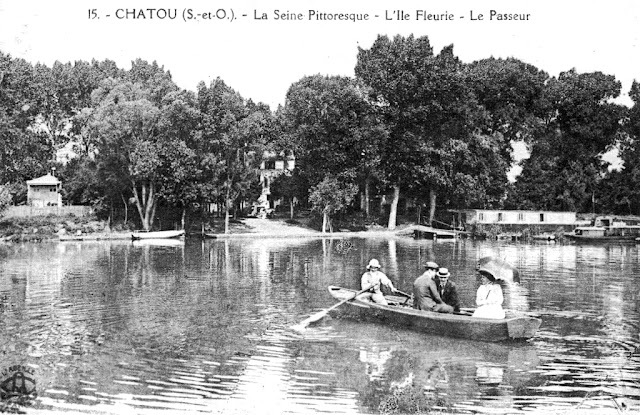 It is also interesting that 9 out of the 12 competing were wooden dinghies. 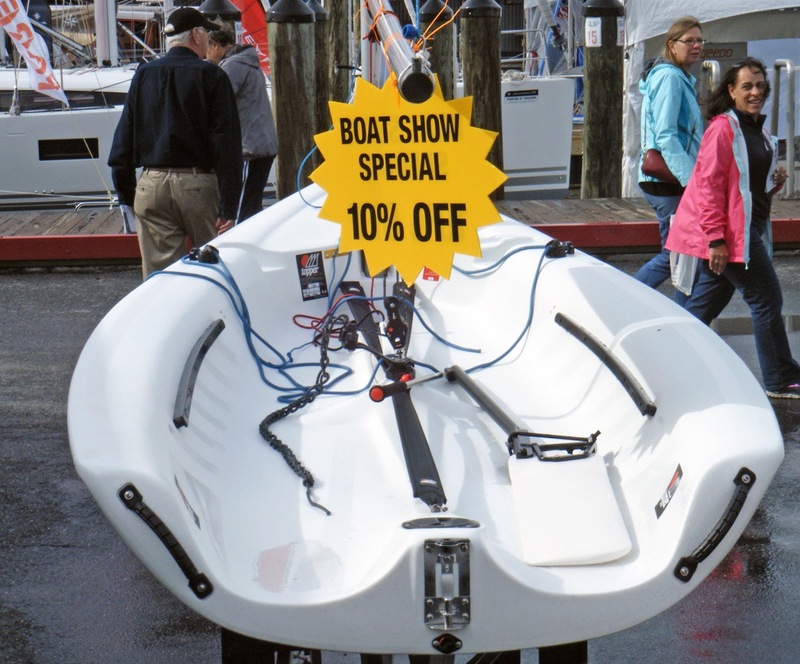 I was set to drive over to St. Michaels for the Mid-Atlantic Small Craft Festival, that first Saturday in October, to view the hodge-podge of small craft, most home-built, but it was a weekend of torrential downpours. Just before I was to get into my car for the one-hour trek to the Eastern Shore, I checked the weather radar and there was a blob of precipitation camped over St. Michaels. (The precipitation was caused by an offshore low which also has a tendency to flood the Festival site - boots required.) I cancelled my plans and stayed around the house, puttering on various projects. The rain was not as bad as it looked on the radar. 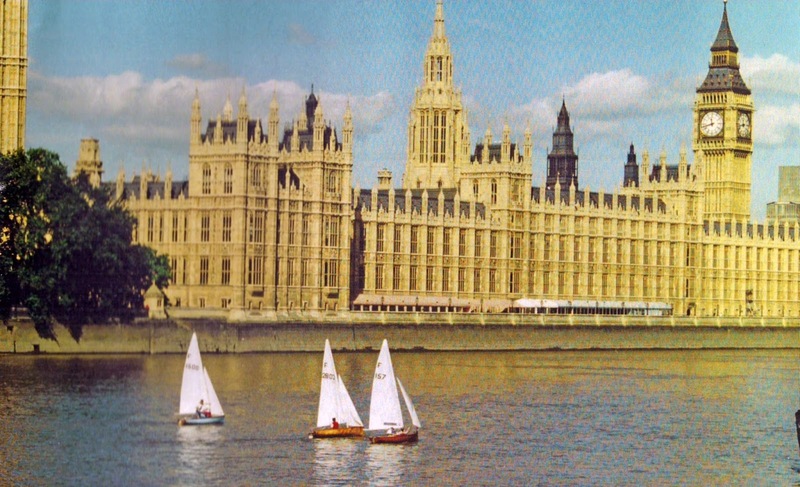 It actually appears to have stopped for the sailing race. 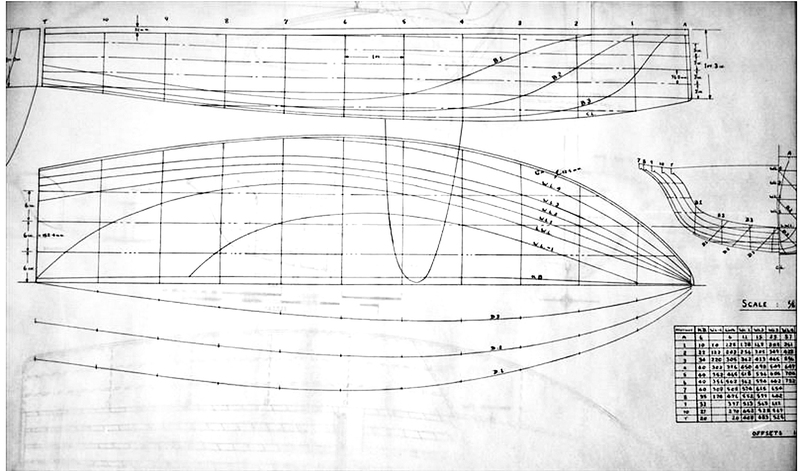 There was a very interesting Frankenboat - a modified Nethercott International Canoe hull. The sliding seat has gone away, replaced by amas for stabiltiy. 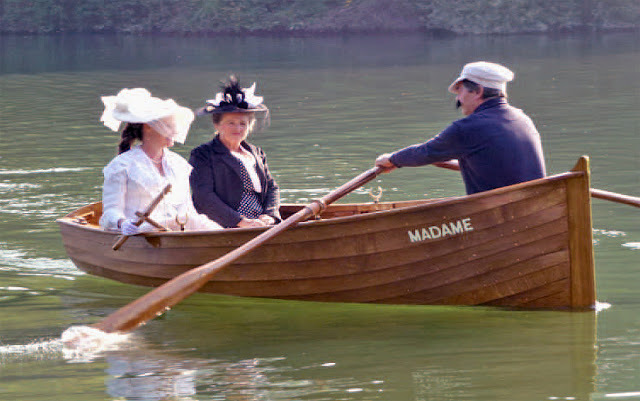 He has set up this craft for rowing. To do this he had to get rid of the daggerboard trunk and set it up with a leeboard. The jib on the IC has gone away. 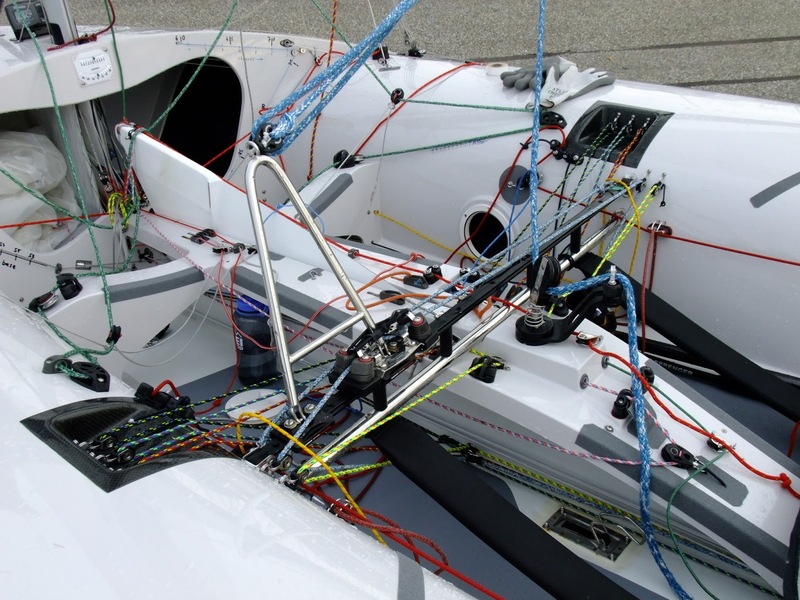 The rig is an unstayed, carbon, cat-rig with the option for an assymetric (note the fixed sprit). 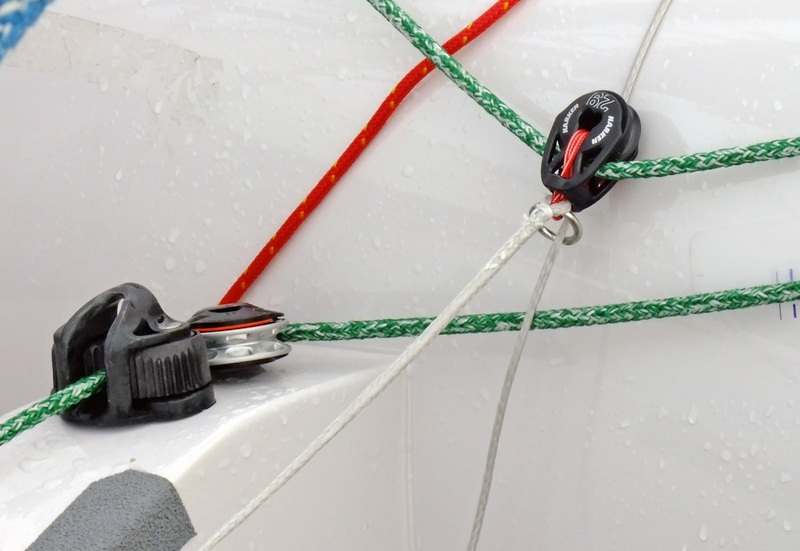 To fit the unstayed rig he needed to extensively modify the bow so we see a new cedar-strip foredeck with a large storage hatch. 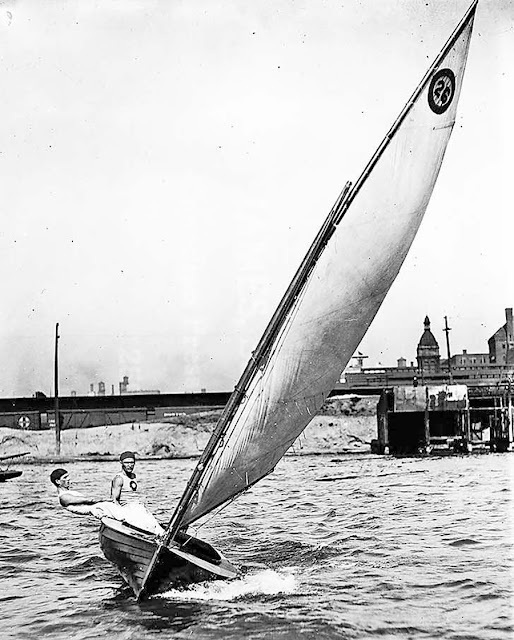 Unfortunately there are no photos I could find of this Franken-Nether-IC sailing which may indicate an engineering failure in one of the systems (for one, the beam with the amas and the height of the amas looks to be inadequate for a powerful sailing rig). 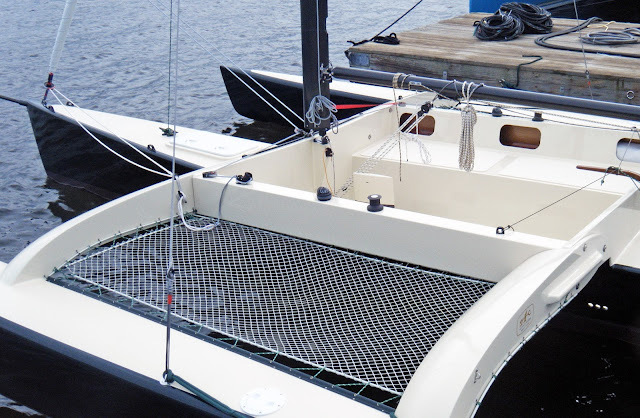 An interesting concept though and hopefully I'll bump into this craft in the future. This past summer I had an interesting conversation with Mike O'Connor of the Larchmont YC V-15 fleet where he indicated that sailing dinghy ownership by Millennials was also down, particularly in the racing dinghies. He attributed this to several factors. Burnout. 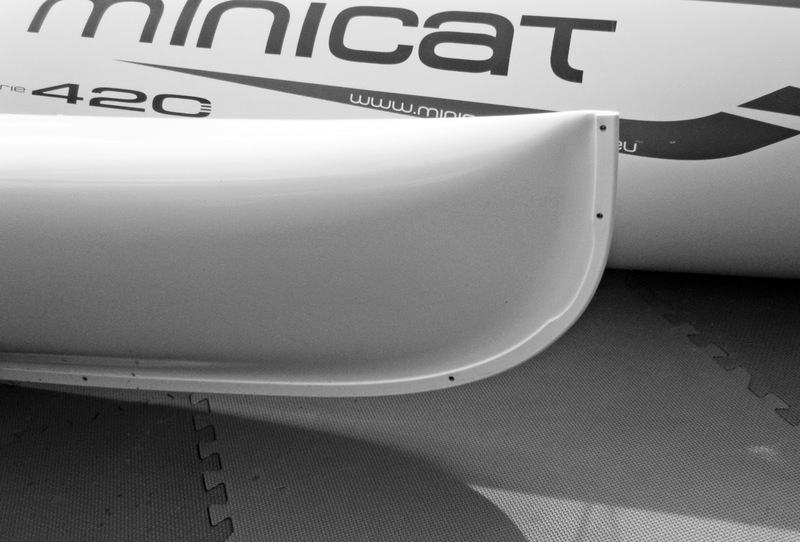 Modern junior racing and college racing programs are high intensity sports. When a young sailor is subjected to eight to ten years of year round training, they are ready, upon graduation, to do something else for fun. 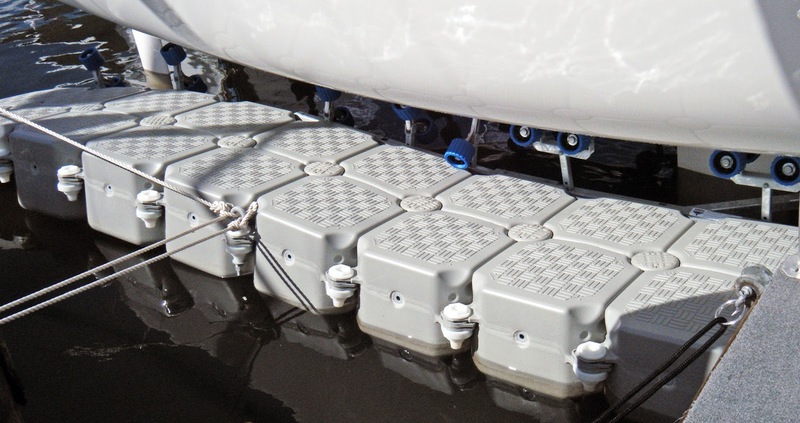 If they do want to race, they want to show up on the dock with a life-jacket and race a boat they don't own. What would this trend mean in the future? An increase in community sailing programs with community owned boats? 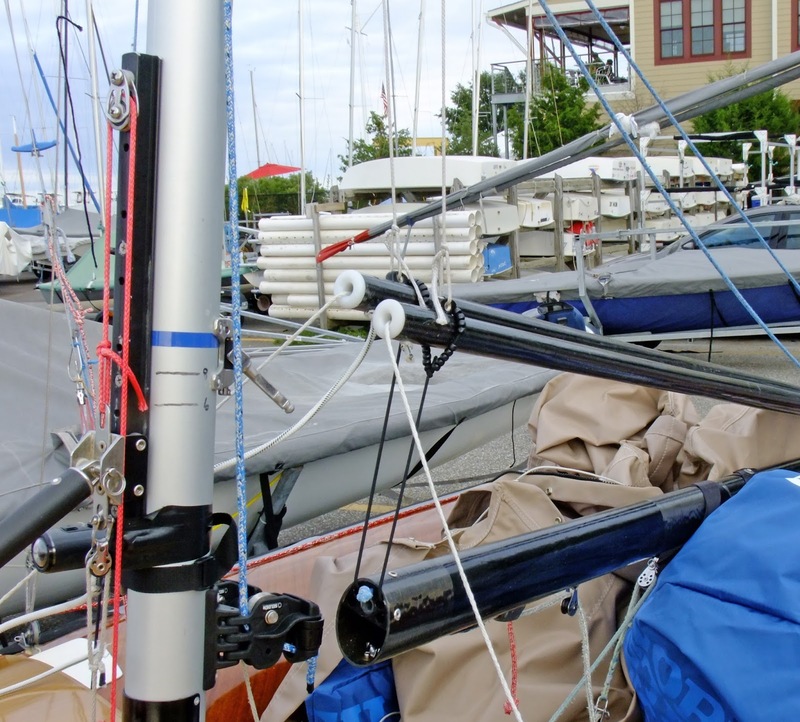 Yacht clubs forced to finance their own club-owned sailing fleet? 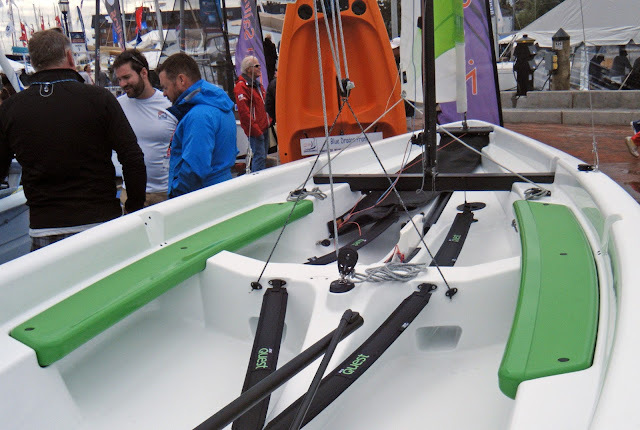 A focus on local fleets and not so much on a national class? 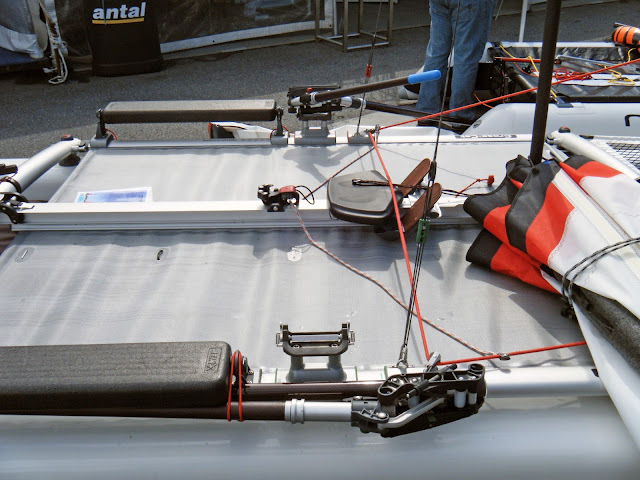 I'm not sure but I think the current popularity of the super-portable, easy to store, easy to rent, stand-up-paddleboards (SUP's) may be a harbinger of a future shift on how we approach dinghy sailing and racing. 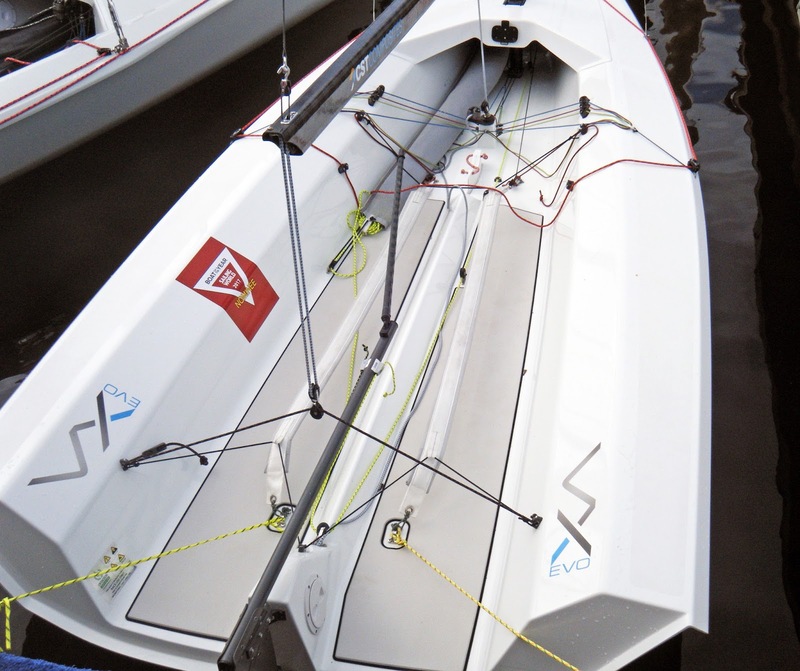 The Tiwal is the French inflatable sailing dinghy. 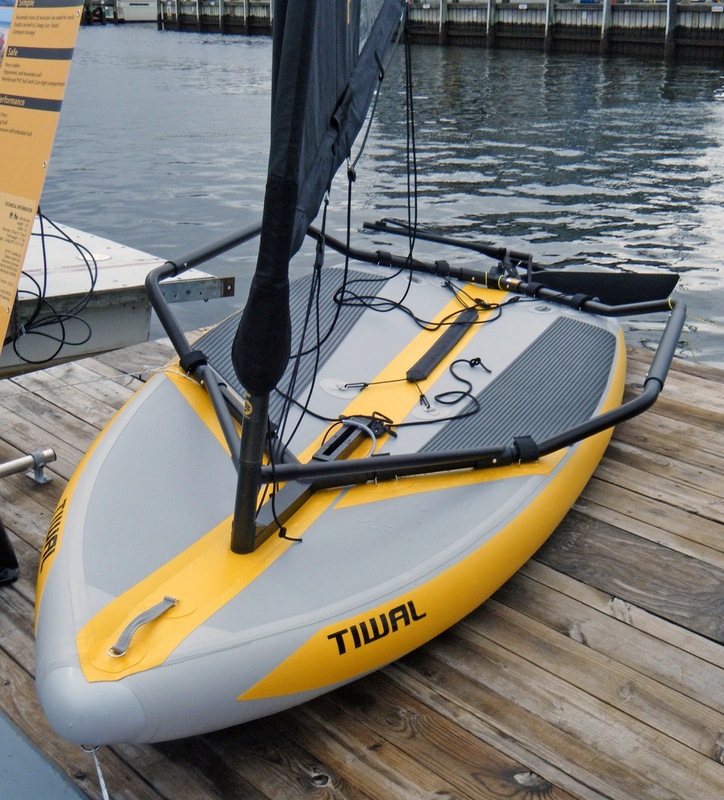 Tiwal has been shown at the Annapolis Show for the last couple of years, but I've quickly walked past the booth, dismissing it (from my hard hull, traditional dinghy perspective) as most likely a very slow-performing, oddity. Thus, the Tiwal never made it into an Earwigoagin post. Why post about the Tiwal this year? 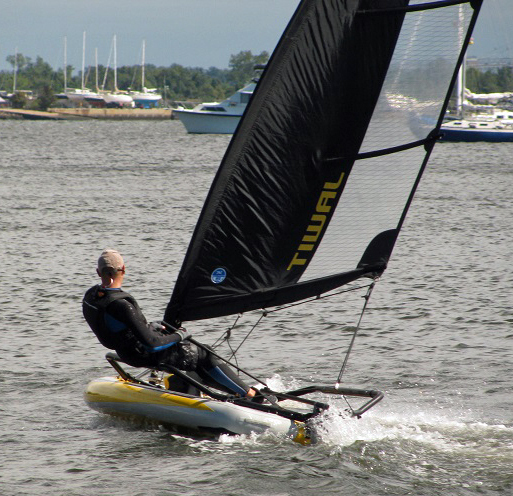 During the show, Tiwal had one of their dinghies out bombing around on Annapolis Harbor and, I must admit, the Tiwal sailed well, tacking easily and showing a good turn of speed. It's time to confront my prejudices and admit that there may be something to this blow-up sailing dinghy. 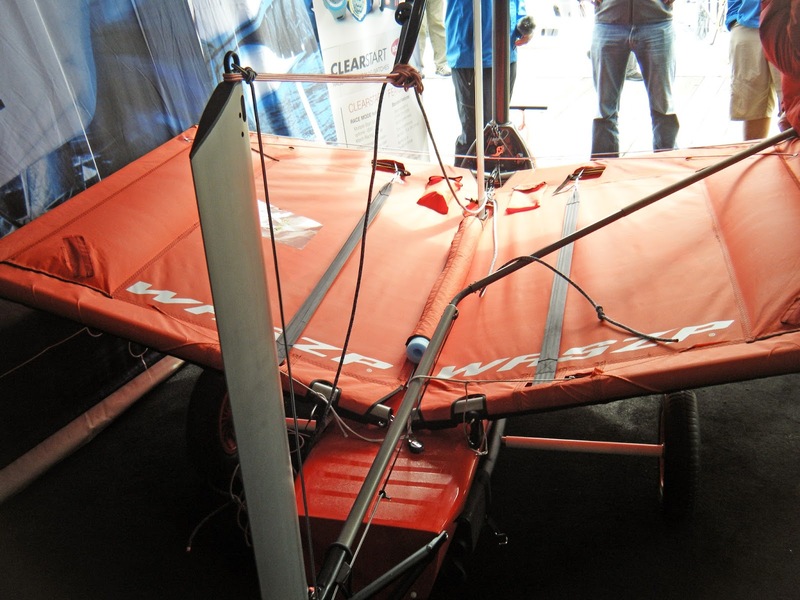 The Tiwal is a 3.2 meter (10 1/2 foot) scow, or in modern parlance, a fat stand-up paddleboard. (To my eye, the Tiwal looks like a small, modern version of the 1900 French scow, the Monotype de Chatou; though I doubt the designers actually referenced this vintage design.) 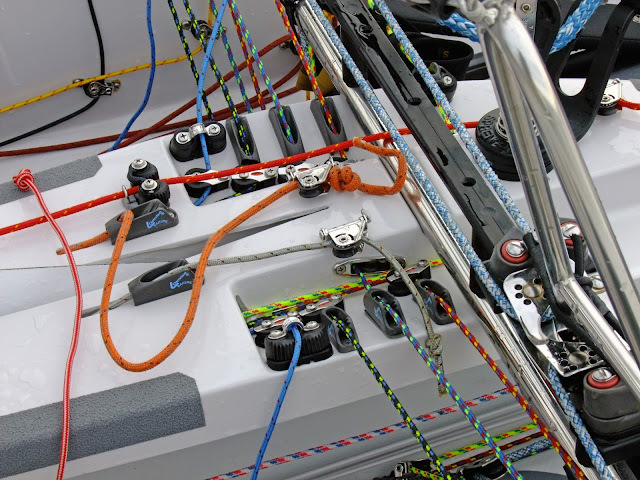 An exoskeleton of interconnecting tubes and wings, support all the sailing bits; mast, daggerboard, rudder, skipper - one reason I find the Tiwal an engineering marvel. I was pressed for time so I didn't spend any time talking to the salesman at the booth; I just had time for a quick photo. The trend in the United States is for the young to prefer to live in apartments or townhouses (something the Europeans have always done). Without a large yard to store large objects, the easy-to-store Tiwal may gain some inroads among millennials, who are trying to figure out how to go boating without worrying about where to stash a boat on a trailer. 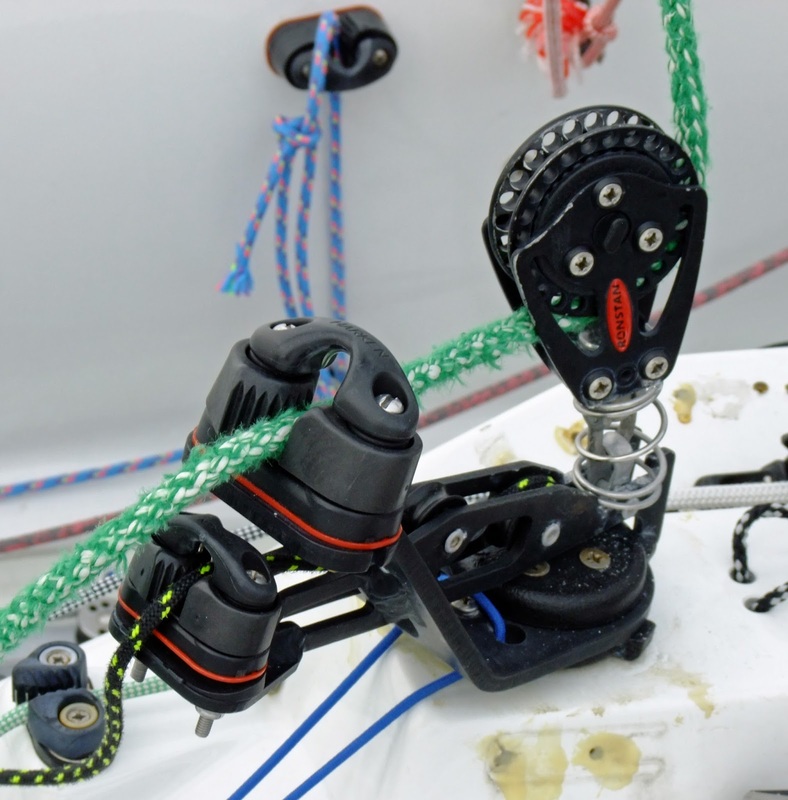 The following video is this years Tiwal Cup, which looks to be a fun-based regatta held in France. 2016 TIWAL's CUP from TIWAL on Vimeo. 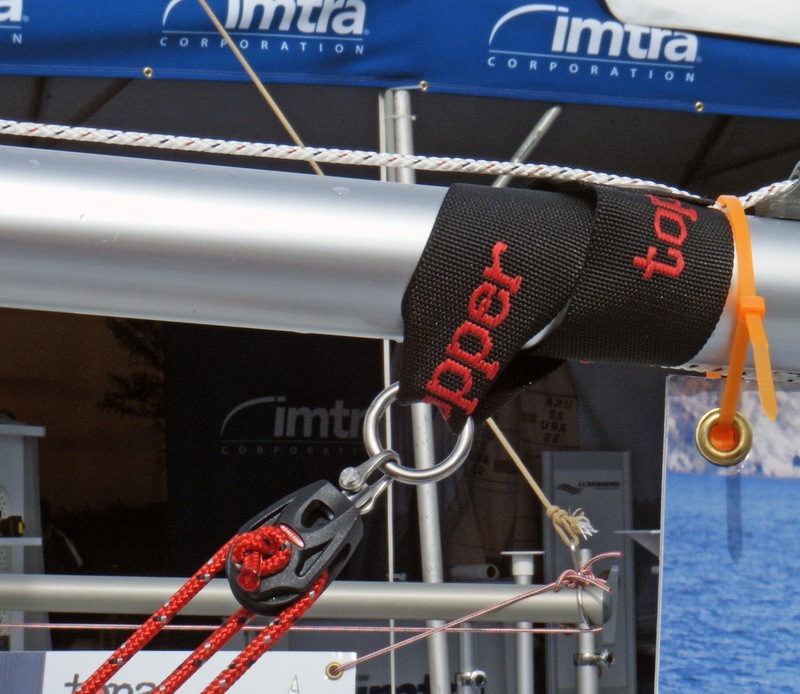 George A. has a better camera and took a better shot of the Tiwal sailing in Annapolis Harbor, so I lifted the photo from his post on the 2016 Sailboat Show.